This gorgeous 9 carat white gold Perfect Fit bridal set is emblazoned with diamonds in an elegant pear shape halo formation around two stunning centre diamonds. More round cut diamonds are set in the wedding band, to give the perfect amount of sparkle. Perfect Fit bridal sets ensure that both of your rings will set together perfectly. 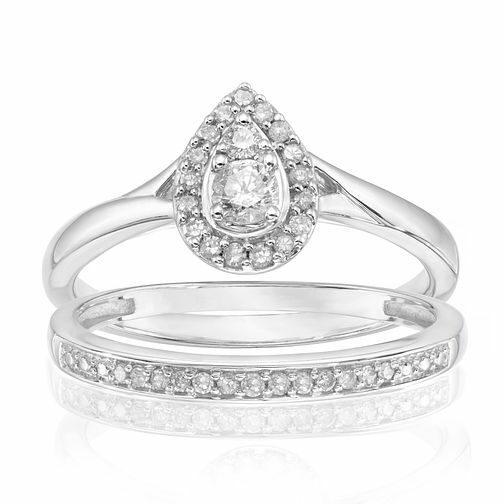 This bridal set has a total diamond weight of 1/4 carat. 9ct White Gold 1/4ct Diamond Perfect Fit Bridal Set is rated 5.0 out of 5 by 4. Rated 5 out of 5 by Anonymous from Love this ring!!! This ring is so lovely, the pictures just don’t do it justice at all. It’s elegant and quite unusual. Absolutely love it.